CCFA is encouraging pig producers to apply for funding to convert their barns from cruel stalls to group housing for pregnant sows. The funding is available under Growing Forward 2, a multi-billion dollar federal-provincial-territorial agriculture policy. 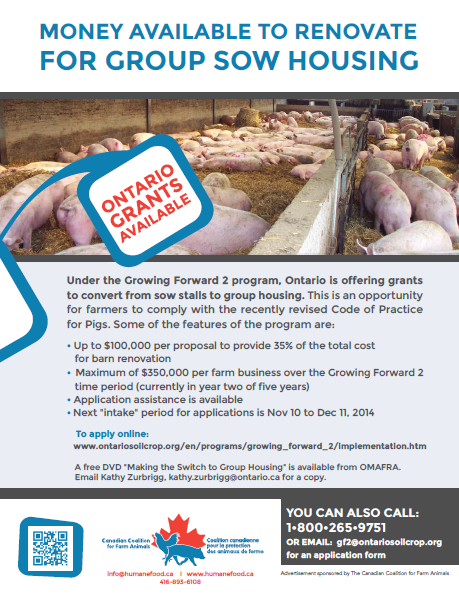 Recently, CCFA Director Vicki Fecteau funded a full-page ad in Ontario Hog Farmer to inform producers of available funding under GF2, and had a letter published in Ontario Farmer. Producers also will have the benefit of a soon-to-be-launched website that will track housing conversions across Canada, and share results with producers to help them select barn designs and feeding systems. Group housing is coming. A coalition of Canada’s 8 largest grocers have committed to ending the purchase of pig meat from sows kept in stalls by the end of 2022. Meanwhile, the industry’s Pig Code of Practice calls for an end to sow stalls by 2024 — however, the Code is voluntary, and still allows stall use for 35 days during a sow’s pregnancy. Growing Forward 2 is a 5-year initiative “designed to encourage innovation, competitiveness and market development in Canada’s agri-food and agri-products sector”. The next window for applications is November 16 – December 3, 2015. To apply: 1-800-265-9751 or gf2@ontariosoilcrop.org. While ethology is not a novel concept in animal science (it dates back to research first started in the 1930s), ethologists are now filling relatively new roles at companies like Maple Leaf Foods and Cargill. The WCVM position is being established in partnership with the Saskatoon-based Prairie Swine Centre. According to the Centre’s CEO Lee Whittington, the new hire is part of a program that will double industry funding for welfare-related resources and research. Sonia Faruqi describes her book as ‘an accidental journey', and that's exactly what her story is: a straightforward, narrative account by an Ivy League investment banker of how she left Wall Street and, without intending to, immersed herself in the world of industrial farming. Taking a break from banking following her layoff in the wake of the 2008 collapse, Faruqi moves to Toronto and decides to volunteer at an organic dairy farm. Eager to work with happy cows in a pastoral setting, she quickly discovers that modern farming — even organic farming — is anything but. While her awakening makes for a page-turning — and at times stomach-turning — read, what makes the book all the more compelling is that Faruqi embarks on her journey with no particular agenda, no axe to grind. She approaches her quest with an open mind, to the point that while she finds the plight of the animals sad and eye-opening, she readily admits how much she likes some of the farmers themselves. And that’s another factor that makes the book so good: Faruqi weaves into the story the farmers’ very real, personal lives — the unhappily-married dairy-farming couple that despises dairy farming and wants out of it… the egg farmer with 13,000 battery-caged hens who dotes on his dog and whose wife is vegetarian… the slaughter-plant worker who talks easily as he stuns and slits the throat of a sheep, then later invites Faruqi to join him for a vegetarian curry lunch. 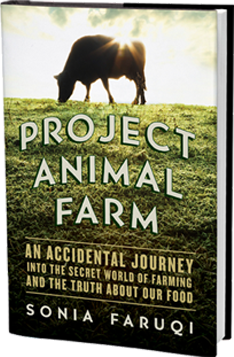 The juxtaposition and irony throughout the book are a reminder that agriculture is not always a black-and-white issue; however, overall, what is very apparent is that the system is broken, and animals are paying the price. Hybrid Turkeys of Kitchener, Ontario, has pleaded guilty to animal cruelty after an undercover video showed workers abusing the birds. The company admitted to failing to exercise proper care and supervision of euthanasia of the birds, and was fined $5,600. Hybrid produces 60% of the 21 million turkeys raised annually in Canada. 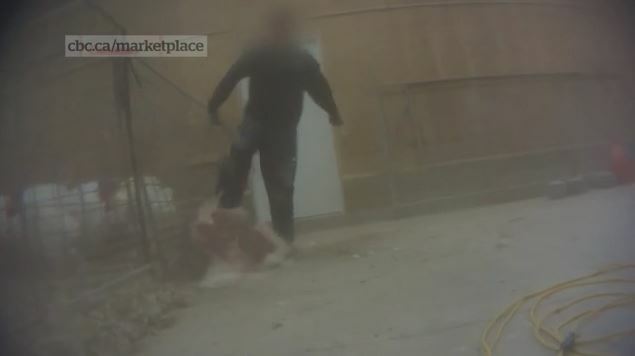 The conviction is the first time a Canadian farm has been found guilty of animal cruelty based on hidden-camera footage. The footage was shot by Mercy for Animals Canada (MFA) and aired on CBC's Marketplace. The video shows workers kicking and throwing turkeys, crushing their spines with bolt cutters, and beating the birds with shovels and metal rods. Some turkeys with gaping, pus-filled wounds and rotting eyes were left to suffer and die. The charges were laid by the OSPCA in July 2014. Five Hybrid employees were originally named — however, these individual charges were withdrawn “as part of the resolution” of the case, said Alison Cross, OSPCA spokesperson. Hybrid is the world’s largest primary turkey breeder with about 200 employees, 50 barns and 11 farms. The company is owned by Netherlands-based Hendrix Genetics Ltd. In a CBC news story, Geoff Urton, Senior Manager of Stakeholder Relations at the BC SPCA, noted that: “There’s a gaping hole in the system with regard to monitoring and inspection of these farms across Canada. There’s not much being done right now and it’s a major concern." They receive no government funding, relying solely on donations and volunteers — learn more about them at londonhumanesociety.ca. Thank you, London HS, for all your hard work for animals and your support for CCFA.. This past spring, the Donkey Sanctuary of Canada opened its farm gates to three new residents: Sugar, 4; Minnie, 20; and Brody, 8. They’d previously lived in a London, Ontario theme park. When their barn burned down, it was decided not to rebuild it. 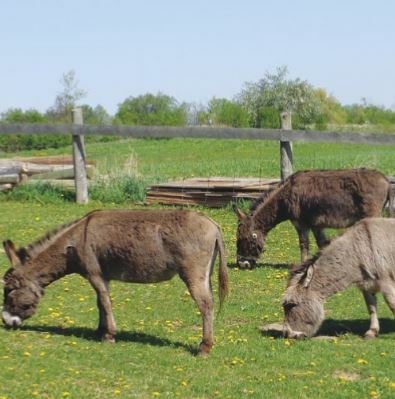 The City of London called on the Donkey Sanctuary of Canada to help. The DSC, near Guelph, Ontario, was already at capacity with nearly 100 animals. Regardless, it graciously welcomed the new arrivals. With proper care, donkeys can live past 35 years of age. They are naturally sociable animals, so luckily for Sugar, Minnie and Brody, they not only get to stay together, but they also join a large donkey family supported by a dedicated team of volunteers. The DSC reports that the three have settled in nicely. Thank you DSC, and here's hoping they have many more years ahead in their new home. If you like our work please tell friends and family about us. Share this email, like us on Facebook and follow us on Twitter. This is a favourite CCFA recipe that is so simple and scrummy, you may not want to wait 'til Saturday morning to make it. Eat these gems as they are right out of the oven, or slather them with your favourite jam. They're also a super simple way to impress weekend guests. If you have a nut allergy, feel free to substitute the almond milk with rice or soy milk. 1. Preheat oven to 400 degrees F. Lightly grease a cookie sheet. 2. In a large bowl, stir flour with a fork to 'sift'. Add baking powder and salt and 'sift' a bit more. 3. Using fork, cut/blend margarine into flour mixture until it's lumpy. 4. Stir in almond milk (again using fork) just until blended. Mixture will be a bit lumpy. 5. Stir in raisins (you can use the fork for that too). 6. Spoon-drop in 8 dollops on baking sheet. 7. Bake for approx 20 min until bottoms start to brown.